Check out the exciting workshop and activities we have planned to coordinate with our upcoming Present Makers 2018 Exhibition! 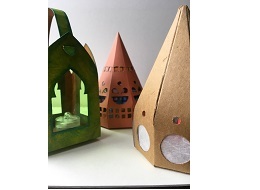 Christmas Lantern Making Workshop: 24 November 11am - 3pm, £8. Booking essential. Festive event/Family Workshop: 1 December, 11am - 3pm, free – drop in. Tunnel Card Workshop: 8 December, 11am - 3pm, £8. Booking essential. Wreath Making Workshop: 11 December 2.30- 4.30pm / 5.30-7.30pm £20 (£18 THG Friends) Booking essential.